Finally the snow has thawed and its time to start thinking about bringing out your bright colors and showing off for some spring entertaining. Whether you like hosting dinner parties, tea time or just want a fun day with the girls, we have the best tips, whether you’re looking for cooking ideas or wondering how to decorate. -Flowers are blooming again, so it’s a great time to take advantage of them in your entertaining. Fill up vases full of fresh daffodils, use china decorated with flowers or, if you are feeling risky in the kitchen, brighten up a salad by using a salad mix with flower petals. Don’t use too many, though, or your guests might not have a reaction of awe but instead with sneezes due to allergies. -As spring brings back the sunshine, don’t be afraid to bring back a little more color into your table. Bright pinks and light yellows can add a pop to your table. 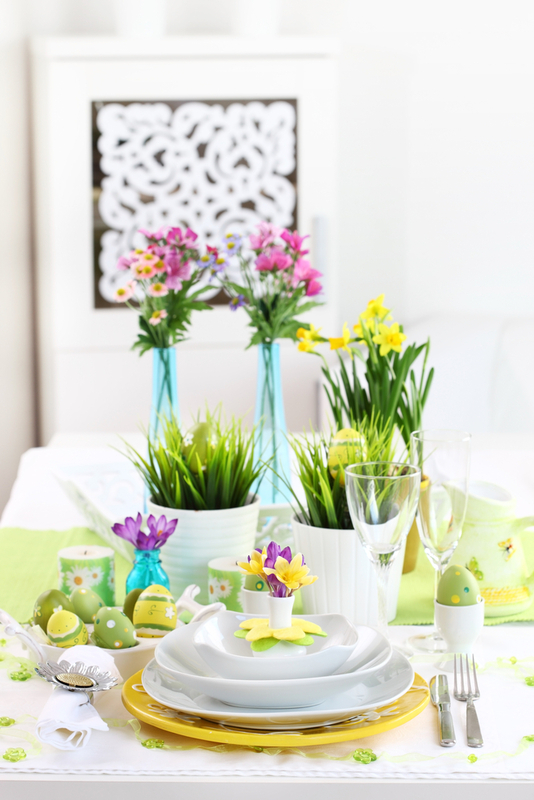 If you like pastels, pick one to pair with your neutrals to make your table pop such as a sky blue or a mint green. Restrain yourself from using all the colors of the rainbow though, or else you might risk your table looking like an Easter basket exploded. -Take advantage of seasonal vegetables and fruits. Spring welcomes bright green leaves as well as artichokes, asparagus, broccoli and peas. Check out your local farmer’s market to see what they’re offering in terms of fresh spring vegetables and plan your dishes around them. -Eggs are a staple for spring holidays, but they don’t have to be multicolored to find a way into your entertaining. Using recipes with eggs can add additional protein as well as some bright color, such as doing sunny-side up eggs with oven-roasted asparagus, a traditional Tuscan dish. If you choose to do a deviled egg make sure that the filling is more creative than the traditional mashed yolk or else you may risk boring your guests. -When it comes to cocktails, fruity flavors are always best for springtime. Steer clear of winter’s darker liquors and opt for lighter flavors to pair with lemonade or orange juice. If you’re more of a wine person, stay away from dark full-bodied wines like Syrah and Shiraz and opt for a sangria, where you can pair your favorite fruits and juices (and sometimes even sherbet) with a light red or even white wine. -As the weather begins to warm up, don’t be afraid to bring out dishes that are served at cooler temperatures. Pasta salads topped with light vinaigrette, chilled lemon bars and even fish ceviche are perfect dishes to bring out with the change of weather. They have lighter flavors that allow them to shine in the springtime. -When you’re opting to do a tea time in honor of the spring, spice up the traditional English-style tea with bright fruit flavored teas or heavenly rooibos, or a red tea. 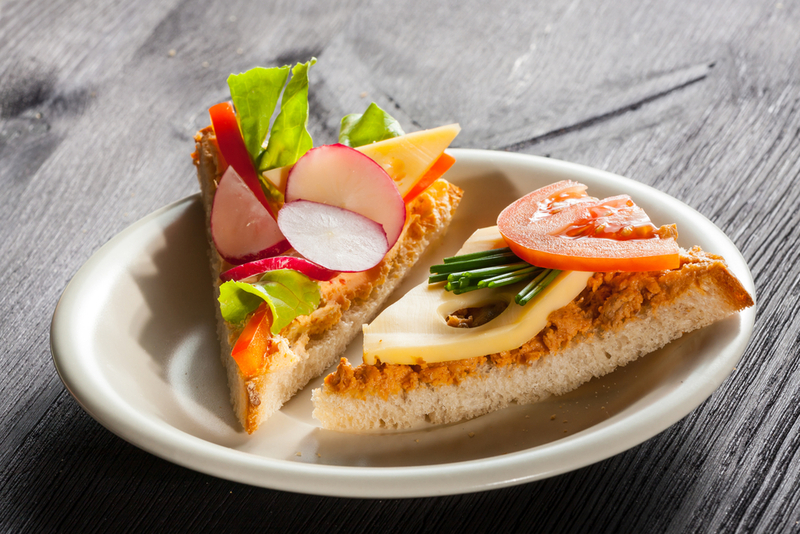 Instead of going for the traditional sandwiches, feel free to use some more inventive ingredients in your crust less confections, such as red peppers or goat cheese instead of basic cucumbers and cream cheese. -Don’t get too carried away with decorations. Tea lights, flowers, streamers, balloons and table runners can all be beautiful on an individual basis. However, if you pair all these things together in your table setup it may look like you’re opening up a party store rather than hosting a party. When it comes to décor, less is always more. -If it’s warm enough to grill, heat it up, but leave the steaks in the freezer. Fish like cod and tilapia are great options for the grill. They have a lighter, fresher flavor, don’t take a lot of time to cook and are very simple to season. Shrimp is also a great springtime option, as they are light and can be given flavor with just some salt and a squeeze of lemon juice. If it’s too cold, not to worry — these fish can also be baked in the oven with just as delicious results. -When the party is so big that you’re afraid you may lose your head, look for ways to make life easier in either cleanup or setup. Plastic plates and silverware now come in varieties that are elegant while providing easy cleanup for you. Preparing salads ahead of time can allow you to give more thought to décor. These suggestions are particularly good for spring entertaining, as you can take the party outside to a less formal setting than a traditional dining room table. We hope our tips will make all your spring entertaining a hit. Let us know which tips were your favorite!